This study examines the relationship of management accounting budgetary activities impacting on firm’s performance. 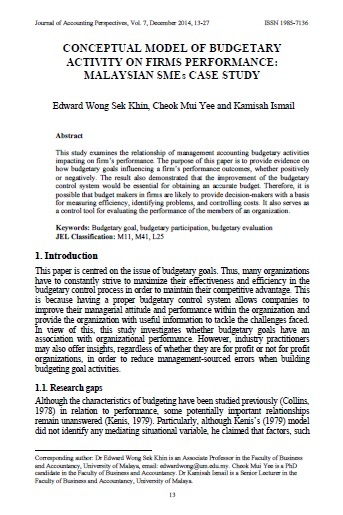 The purpose of this paper is to provide evidence on how budgetary goals influencing a firm’s performance outcomes, whether positively or negatively. The result also demonstrated that the improvement of the budgetary control system would be essential for obtaining an accurate budget. Therefore, it is possible that budget makers in firms are likely to provide decision-makers with a basis for measuring efficiency, identifying problems, and controlling costs. It also serves as a control tool for evaluating the performance of the members of an organization. KHIN, Edward Wong Sek; YEE, Cheok Mui; ISMAIL, Kamisah. Conceptual Model of Budgetary Activity on Firms Performance: Malaysian SMEs Case Study. Asian Journal of Accounting Perspectives, [S.l. ], v. 7, n. 1, p. 13-27, dec. 2014. ISSN 0128-0384. Available at: <https://ajap.um.edu.my/article/view/3690>. Date accessed: 23 apr. 2019.